Seeing sandcastles being built on the beach is nothing out of the ordinary. Finding a sand sculpture that’s the size of an actual three-story castle however, now that’s another thing altogether! That’s exactly what thousands of Jersey Shore goers got to witness being built right next to the boardwalk in Point Pleasant Beach this summer. The ornately sculpted tower is known as the “Sandy Castle” and it was created as a fundraising project to assist those affected by last year’s devastating Superstorm Sandy. 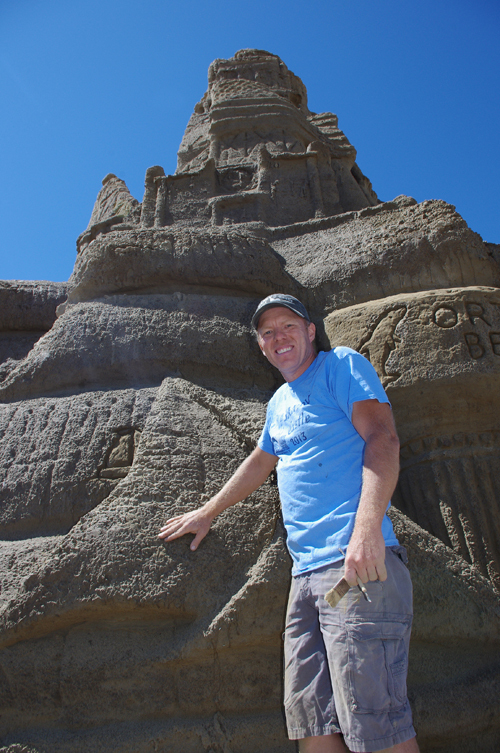 The mastermind behind the castle is an artist named Ed Jarrett, who happens to be no newcomer to the medium of sand. In fact, he currently holds the Guinness World Record for creating the world’s tallest handmade sandcastle. Ed Jarrett’s Guinness World Record holding tallest sandcastle in Connecticut. In 2003, using nothing but sand and water, Ed built a sandcastle 29 feet, three inches tall in his home state of Maine, breaking the Guinness World Record and taking bragging rights away from Finland. In 2007, he broke his own record with another castle he dubbed “Castle to the Sun,” which stood 31 feet, six inches tall. Over a period of two months, more than 1,000 people volunteered to help build the castle, which required 40 dump truck loads of sand. The castle helped raise more than $100,000 for charity. Never satisfied, Ed sought to build a castle at least 35 feet tall and raise even more money for charitable organizations. 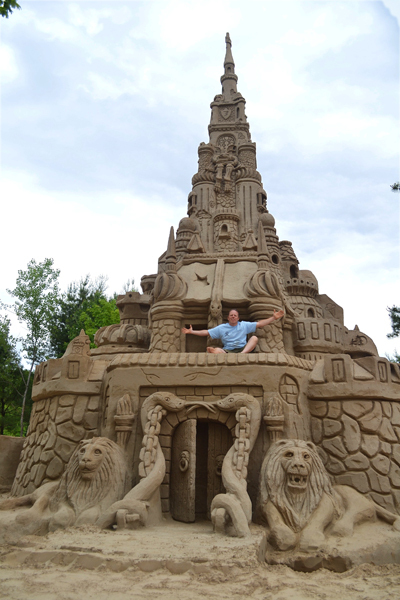 In June 2011 Guinness World Records certified his next creation, Jarrett’s Castle at Winding Trails in Farmington, CT as the World’s Tallest Sandcastle with an official height of 37 feet, 10 inches. This year Ed brought his castle building talents to Point Pleasant Beach on the Jersey Shore. Beginning in March he set out to once again break his own sandcastle record, and at the same time raise money for the relief efforts aiding Super Storm Sandy victims. 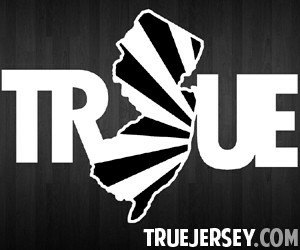 He joined forces with an old college friend named Alan Fumo, a New Jersey resident, to raise awareness in support of NJ Hometown Heroes, a registered non-profit organization based in Toms River. 100% of all proceeds and donations from Ed’s “Sandy Castle” will benefit the charity. 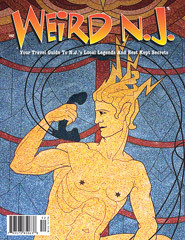 One side of the Sandy Castle is dedicated as the “Jersey Side” and depicts a number or iconic Shore images, such as: Asbury Park’s Convention Hall, Seaside Heights’ Star Jet Roller Coaster, which toppled into the ocean during the hurricane, the Barnegat Lighthouse, and the Ortley Beach water tower. At the base of the castle is a mermaid with a tear rolling from her eye. Other motifs around the castle include reliefs of a shark, a sea turtle, and serpents. On the side that faces the boardwalk there are carvings of lions, gargoyles, demons and dragons, and Rapunzel lets down her sandy hair to her waiting prince below. But Ed’s Sandy Castle never did attain the lofty height necessary to break his own world record, and ironically it was the rebuilding effort itself which foiled his record-breaking attempt. A bulldozer that was clearing debris from the beach caused a vibration that shook the whole castle to its foundation. The shock wave opened a 25-foot vertical fault line down the center of the solid sand edifice. “And then as they were rebuilding the boardwalk the bottom of the castle settled and we realized we’d never break the record with this castle,” Ed told us. 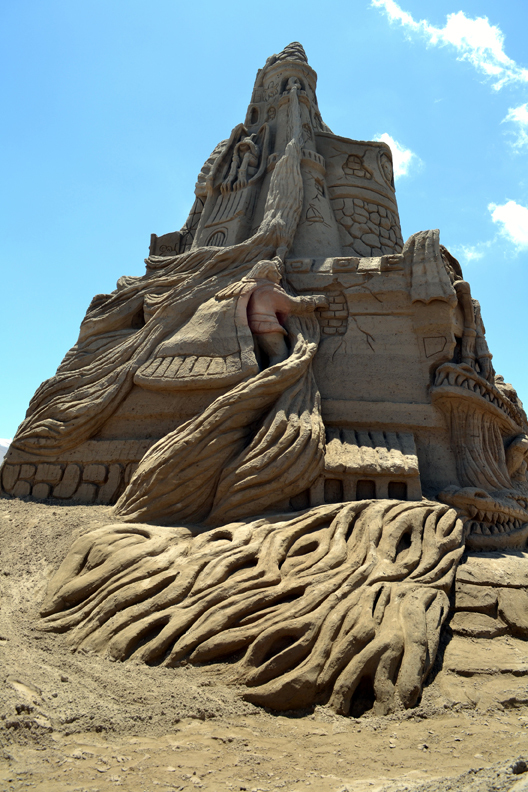 It took six rebuilds to repair the damage, and the decision was made to leave the Sandy Castle at the height of 34 feet––roughly four feet shy of the height needed to break his own record. But Ed still continued to sculpt the castle and raise money through the $1 admission charged to see it, so far collecting about $40,000 for charity. While Sandy Castle still stands tall on Jenkinson’s Beach and attracts hundreds of visitors daily, Ed has already set his sights on the next castle to be built just a few feet away from the current one. “Sandy Castle 2013, Second Edition,” will continue the effort to raise money as well as once again aspire to breaking the Guinness World Record. Sandy Castle will remain intact and open to the public through Labor Day, then Ed will begin demolishing it at 5pm on Monday, September 2nd. 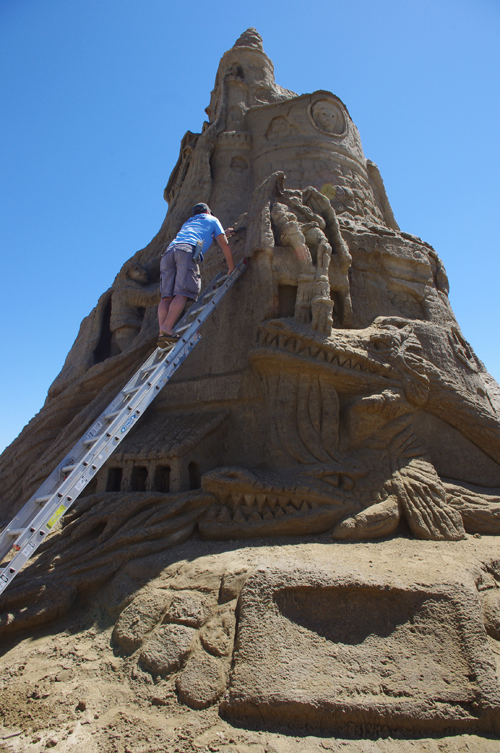 The very next day, Jarrett, along with a group of volunteers, will start removing sand from Sandy Castle and packing it into forms for the Second Edition. The sand packing process will continue through Sunday, October 13th. On Columbus Day (Monday, October 14th), Ed will begin sculpting the new castle. He plans to be finished by October 24th and open the sandcastle for a Halloween Haunt Weekend on October 25th. We asked Ed if it’s going to break his heart after all the months of work that he’s put into this castle to have to take it down? “Do you already have it all designed and drawn up,” we wondered. “So will the next castle beat the current record for the World’s Tallest Sandcastle?” We asked. “That one WILL be the record.” Ed said with supreme confidence. To construct his castles Ed fills a wooden frame with sand then works his way down by removing one band of the frame at a time. He sculpts from top to bottom, never returning to the upper portion of the structure once it has been carved. So highest reaches of the castle are the oldest part of the sculpture…and the most worn by the elements. Over the course of the spring and summer the Sandy Castle has endured a lot of harsh weather. Heavy rains and wind has eroded away much of they intricately carved details that once adorned its façade. We asked Ed if having to deal with the elements frustrated him. 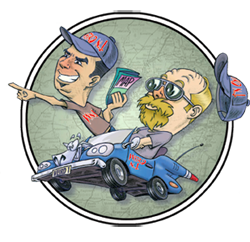 As far a competition goes, Ed says there have been some pretenders to his thrown in Germany and South Carolina, but both of those castles were disqualified when it was discovered that machinery was used to aid in their construction. 4,500 volunteers have come out to assist Ed in his great endeavor of the past six months, packing sand in buckets by hand. 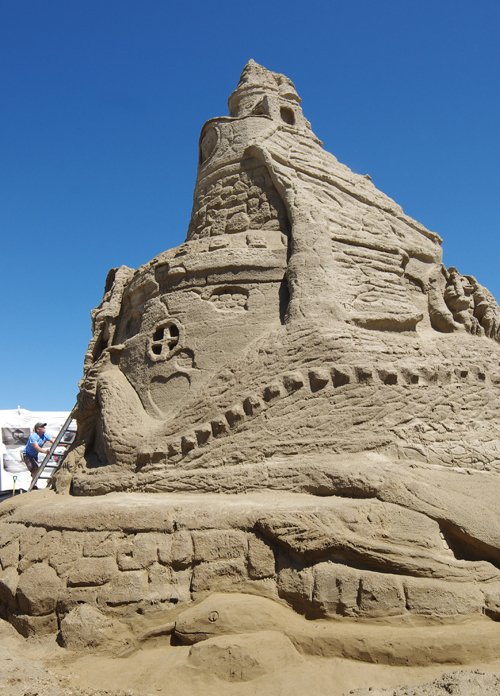 As with the first Sandy Castle, the Second Edition will need thousands more volunteers to help pack the sand to a height of about 41 feet, tall enough to break his current record set in Connecticut in 2011. Those wishing to help can contact the Sandy Castle volunteer coordinator through the website at www.sandycastle2013.com. To date, Sandy Castle has raised about $40,000 and thanks to the generosity of sponsors, 100% of every dollar donated at the gate goes directly to Hometown Heroes for its Superstorm Sandy relief efforts. For more information about Sandy Castle, please visit www.sandycastle2013.com. This entry was posted in Local Heroes and Villains, Stories and tagged ed jarrett, jersey shore, point pleasant, sandcastle, sandy castle. Bookmark the permalink.